The rural lodging Boquerón de Estena is a large stone house with capacity for 18 people, two floors, with 2 ears. It can be rented by full house. In case of full house rental you can enjoy full kitchen with ceramic hob, oven, refrigerator with freezer, microwave and dishwasher, as well as enclosure with barbecue. In all rooms there is a bathroom, refrigerator, air conditioning, heating. All of them have large windows from which we can enjoy the environment, giving great light to the house, in addition the furniture is comfortable to be able to properly leave clothes, cabinets, hangers and drawers. We have rooms with extra beds where a family of 4-5 people can stay comfortably without feeling overwhelmed or cramped. The living room, of great amplitude (65 M2), has wood burning fireplace, comfortable sofas and folding armchairs, as well as television, in it we can spend the rainy afternoons, even the hot ones, enjoying the games of table. In summer, a good swim in the private pool and a relaxing moment in the arbor or in the playground with swings is appreciated. If we are curious about fossils and minerals, we have the opportunity to see a beautiful and interesting exhibition of fossils in the premises adjacent to the house, as well as visit our permanent exhibition with farming implements. In our Events Room, with capacity for 50 people, you can contemplate, with guided tour, our magnificent exhibition of Navas de Estena fossils, complete with fossils and minerals from all over the world. 140 km. of Madrid, 70 km. from Toledo, 80 Km. from Talavera Reina, 100 km. of Ciudad Real. We are in the province limits of Ciudad Real and Toledo, at the entrance to the mountainous area of ​​Cabañeros National Park. (National Park that has obtained in the 2. 009, the European Charter of Sustainable Tourism). 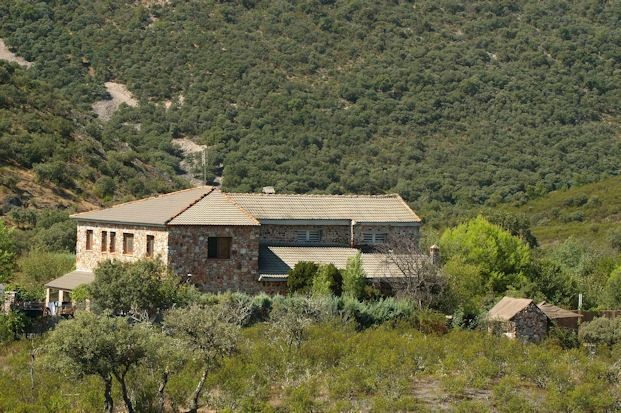 The rural house Boquerón de Estena is located in the heart of the National Park of Cabañeros, to the outskirts of the town of Navas de Estena (Ciudad Real) , near Toledo and Madrid. It is accessed through a well-conditioned road for vehicles. The rhythm of the seasons, invites to the siesta, the so-called "Iberian Yoga", which is essential to be able to enjoy at night the gastronomic evenings and starry skies as you have never seen, throughout the year.